Bear with me..I am typing this from a mobile phone heh. There is a fairly widely supported theory that Persephone’s time in the underworld is concurrent with the summer during which the heat reaches its heights during which, supposedly the earth would have lain fallow until planting resumed in the autumn. In this theory then Persephone is rising in the autumn. However there are several problems with this idea, and reasons why I don’t accept it into my own worship. 1. There is no festival anywhere near the beginning of summer which would indicate the descent of Persephone. There are those who suggest that the Lesser Eleusinian Mystery in the spring is the descent of the Persephone however this falls out of alignment with other festivals. For instance it is so closely placed to the Anthesteria, a festival of flowers, that it generally conflicts with the nature of Anthesteria. Likewise this disregards that Thargelia in May was celebrated with green unripened wheat in Athens, and that Rhodes had festivals for Apollon and Dionysos Smintheus in which they killed rats that would eat the plants, as well as a festival to Apollon to prevent “rust” from attacking wheat. It also startlingly conflicts with other ideas that scholars have that Apollon brings the wealthy of grains from Hyperborea in the summer. 2. This theory of wheat harvest in spring assumes that the ripening of wheat occurs in a period with rain. This is not true. Wheat needs considerably amount of rain to begin growing but they also need a dry period in which to ripen. Festivals to prevent “rust” (a micoorganism which attaches itself to grain plants) occurs in unseasonably wet environments. We see this is in the above mentioned festival to Apollon, and in Rome there was a similar festival in the summer for Mars who likewise protects the grains. Wheat has a fairly long growing cycle, but like most vegetation one that is thankfully sped up in northern climates due to longer hours of sunlight that the north has in comparison to more southern climates, so that grain can be grown anywhere. 3. This idea also assumes that harvest and planting does not occur, more or less, side by side…which is rather daft. One can harvest, and in some instances burn the reminants of the feilds (such as seems to occur with sugarcane harvest), and then go back over a couple weeks later and start planting. In many subtropical climates there is a very fine line between harvesting and sowing seasons. I once had a friend from Nola who said that her figs, and other trees, she would shake in the autumn to help speed along the dropping of the old leaves and within a very short period there would be new leaves emerging. 4. This idea also ignores that the symbolism involved in autumn planting…the seed is going into the earth…the grains from the harvested/sacrificed ear of wheat is going into the earth where it may be fertilized by the rains of Zeus and bring blessed prosperity upon us all. Whether this sprouting occurs in winter or spring in cooler climates matters not. We set the seed into the earth (just as the flowers and trees let loose their seeds naturally to lie dormant in the earth until the appropriate season comes) with the hope for growth and a new harvest. So here we have celebrated the return of flowers with Anthesteria (not ignoring the fact that there are hardy plants that may have blooms in winter such as violets..and even the crocus was said to bloom in the winter) in which all the beautiful flowers of spring have colored the world. We see the poppy blossom in opposite of the wheat ear. The tender young growth of wheat is growing for certain, drinking having drunk and still drinking the rains of winter and those of the approaching spring. So whereas some will hold to the idea of Persephone’s time in the underworld during a fallow summer, I see no reason to adopt this idea. This was my first time celebrating Proerosia, and it is usually because I forget and then remember the following day when Pyanepsia rolls around. But this year I was on top of things, which is in part thanks to an incredible network of reminders! Unfortunately as with all first time rituals things didn’t exactly go off without a hitch. I discovered that the barley I had thought I had somehow disappeared. So I was without barley to make the drink for Demeter which is discussed in her hymn (the water, barley, and pennyroyal mixed together according to the english translation). I already knew I didn’ thave the pennyroyal but I figured I would substitute that with honey which is a not uncommon offering for Demeter. But alas the barley was gone so I ended up dissolving the honey in water and setting the dish on the altar while I waited for the proper moment to give the libation. In good mood for the ritual I was thus inspired also to write a poem for Triptolemus who is a divine being associated with the planting season. In addition I had picked out a whole slew of poems from the Orphic Hymns including the poems to Pluto, Sabazios, Artemis etc. I did notice that if I lit the candle under the burner and left it going through the invocational hymns at the beginning of the ritual then it does almost get hot enough to melt the frankincense (or at least softens it considerably so that what is left of it pretty much dissolves when the libations are added. The effect was rather different than what I had expected from my experience with the equinox. Rather than the bittersweet somberness of the latter ritual, this one was imbued with a current of subtle energy humming. It was rather unlifting in of and of itself! And so that was my Proerosia. Bless Proerosia to everyone and I pray that everyone has a great Pyanepsia tommorow! More on Pyanepsia tommorow night! 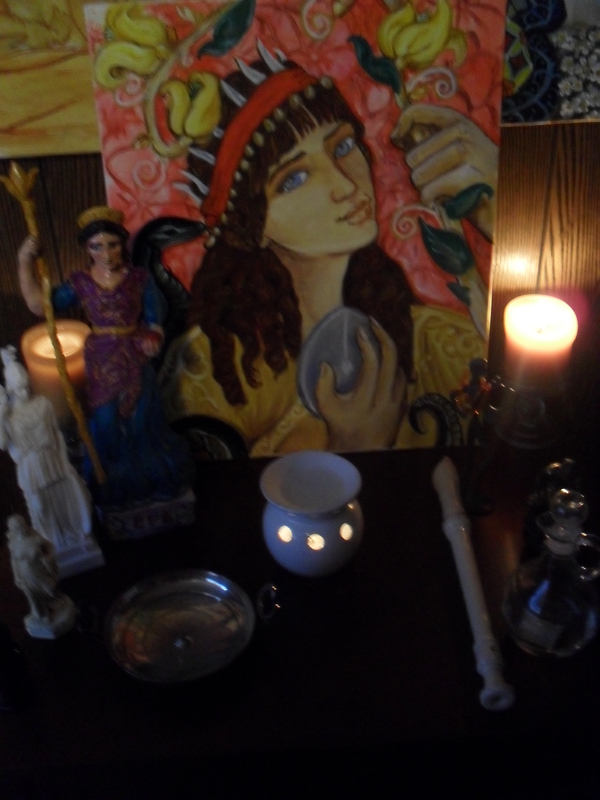 I celebrated the “kidnapping”/marriage of Persephone as the first part of my Autumn Equinox ritual (part 2 to be carried out this afternoon with a ritual for the transference between Apollon and Dionysos/Departure of Apollon for Hyperborea). This is one of my favorite rituals of the year just because of the feeling of tranquility that comes with it, there is something appropriately subdued and bittersweet with the ritual as we acknowledge that Persephone has departed from the company of the gods to dwell at the side of her husband. That it is bittersweet is not abnormal, that is the sort of feeling that accompanies any sense of marriage if you think of it…the girl, now a wife, departs from the home of her father and mother to make a home elsewhere of her own. Back in the day, before the advent of internet, this provided the potential that the parents would not see their daughter again, especially if they moved far away. this is almost the opposite of the high festivity with the marriage of Zeus and Hera. It is still a large celebration but the spirit of it is different with the inconsoluable mother, the virgin bride swept away from her home not entirely willing (*cough* arranged marriage *cough*) and the accompanying transformation in life as we see the change of the seasons. This ritual is something of a big affair in my home. Firstly because there are alot of gods that I pray to in the context of the ritual so that means alot of hymns. Hestia, Demeter, Hera, Zeus, Persephone, Dionysos, Hermes, Poseidon, Artemis and Apollon, Helios, Hekate, and Cthonic Hermes. This is far more than what is typical in most of my rituals. I also broke out my recorder for this ritual as I did for Karneia and played on it, all low sweet notes rather than the higher cheerful ones in memory of Demeter’s pain. All during this ritual I felt a sense of settled within, or a sense of the self seated firmly at the core of my heart. It is difficult to explain in any other words…but this is what contributed to the calming effect of the ritual…just the internalization involved…a strong connection to the true self within. It is just a powerful experience. I always enjoy the equinox rituals, and I use plural here for a reason because equinox is a two day event for me with different focuses. The first day (the day before proper equinox–or calendric equinox) is reserved for celebrating the departure of Persephone. I know some folks celebrate it earlier depending on when the moon falls (so sometimes it can be closer to the equinox and sometimes—like this year—quite some time before). Sadly I got my calendar turned around and missed Boedromia this year *sigh* I really need to remember to actually write out my calendar so nothing gets accidentally forgotten…I was just so caught up in Karneia that it skipped my mind. But for the departure of Persephone I always celebrate it on the first day prior to the first day of autumn. So for this year that will be September 22. On the 23rd, the first day of autumn I celebrate the transference of power from Apollon to Dionysos as Apollon retreats to Hyperborea. In preperation for Karneia I was thinking of the significance of the first harvest and what that may mean to us on a spiritual level. It is seen also in the celtic celebration of Lughnasadh ( I apologize for butchering the spelling there) as well as in Hellenismos with the festival of Karneia–the so-called shepherd’s festival during which Apollon was offered grapes even as Lugh’s festival has a deep association with the harvest of another fruit–the apple. That there are multi-cultural festivals that tie into an idea of a first, or initial harvest prior to the main harvest season of autumn it does make for some interesting contempulation. We know that the second harvest..the wheat harvest of autumn is directly tied to the daughter of Zeus and Demeter, Persephone. A divine being who returns the world below (which really makes her closer to us as the mortal world has been noted by Plato as being below that of the isles of the blessed as we are living beneath the sea to make a general paraphrase) then to return again among the divine. This coincides then with the passage of the seasons. After the first harvest though it is not the end of a growing period during the year, really we get at least one more month afterward of steady growth. Even in Alaska where I grew up there was the plentitude of growing things in September until near the end of the month when the hard frosts finally arrived, though the winds between mid-August and in autumn were strong and cool. Therefore in comparison to the great autumnal harvest, the first harvest of summer seems rather small and of little worth. And it is the autumnal harvest that gets all the attention for the transition of the soul…but this idea often seems to be carried out incorrectly because it is drawn on the idea of the soul following Persephone from life to death, yet this ignores that Persephone is a goddess, the daughter of two great Olympians, so whereas her cyclic journey can be interpretted in some ways in connection with the journey of the soul…she is divine returning to the earth from the blessed abodes of the gods. She is the harvested wheat that is both replanted to return in the spring but also is made into bread to sustain the living. She is the comfort to all, both living and dead really, and she provides this comfort by her journey from the divine abodes, even as life perishes and people are sustained by the harvest that they have cut. So then having established that the second harvest, the autumn harvest, is the harvest of the divine daughter, what can we say then about the first harvest. The fruit harvest. I think a significant clue can be inferred by the offering of grapes during the Karneia, the grape which is the symbol of Dionysos and likewise also a symbol of the unperishing soul of mortals that is transforming (for the grape is made into the wine is it not?). Therefore we can say that the first harvest is more about mortal death (and thus also linked with the sacrifice of the ram by shepherds) and the progression of the mortal soul. We are the lamb that has been nursed and reared into adulthood, we are the cultivated blossom that has been fertilized and born the fruit. So whereas the second harvest is based on the transition of the Kore, the first harvest is based on evolution of the human soul under the domain of Apollon and is thus overseen by Apollon in his festival Karneia, Apollon the shepherd who has cared for us, guided us along the mountainous paths and into the valleys, and the shepherd who slays us. We are the tender fruit of the first harvest, and Persephone is the golden grain of autumn which too shall be reaped under the great eye of Apollon.